We've explored the jungles, the deserts, the arctic, even the moon. But one place still remains a mostly uncharted mystery; our oceans. than we do about what lies on the bottom of the sea. both scientific and economic gains. 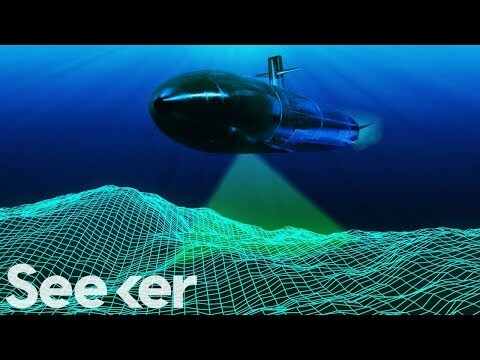 So, how close are we to completely mapping the ocean? how deep our oceans are. used satellites to map the entire ocean. The way that they do satellite mapping of the ocean, they use altimetry. can measure the different heights of the ocean surface. of what it's like down there. But decent isn't good enough. can see features and objects larger than 5km across. of the moon has been mapped to 100m. Less than 10% of our oceans, and maybe closer to 5%, have been mapped to this detail. Having a detailed map would greatly change how we use the ocean. It would help with safety, like charting potential hazards that could take down a ship. It would help with laying down ocean cables, fiber optics and pipes. precious metals used to create your cell phone. inevitable rush to further exploit it begins. don't mine, for example, a rainforest and put your protected area in a desert, right? So ocean mapping may be this double edged sword. geological and biological discoveries along the way. that have the potential for copper and nickel and cobalt. So if everyone wants this map, why hasn't it been done yet? Well, it'll cost a lot of money. and take a lot of time. Maybe as much as 200 ship years. whole ocean or 200 ships one year. three billion dollars to map a planet?" million dollars or so and mapped the moon much better than we've mapped our planet. We've sent missions to Mars, many missions to Mars. Each one of those missions cost between two and three billion dollars. And so we have the will to do that. it takes to bounce back, scientists can more accurately image the ocean depths. We're also trying to develop techniques to speed that up, to do it more quickly. developing at the moment, but that's still in its infancy. into a 3D map of our oceans. Which is another hurdle we still need to figure out, what to do with all this data? you need to get put all together in the same place. And one boldly named group, Seabed 2030, is looking to lead that fight. the ability work with and root for Seabed 2030 and their nearing deadline. that we'll have the oceans mapped by 2030. I think, the global initiative to have it done by 2030 is going to be quite an undertaking. but I'm optimistic and I think it will happen at some point. people, ships, advanced technology, global cooperation and of course, money. So, how close are we to mapping the entire ocean? We're gonna give it our darndest to do. It's a very, very ambitious goal. So that's our goal is to see it all mapped by 2030. Thanks so much for watching another episode of How Close Are We. If you have any ideas for future episodes, let us know in the comments. an ongoing series about one man's journey to swim across the Pacific Ocean.